A perfect way to store your LPs. These ultra-clear sleeves include an adhesive strip at the top, forming a perfect seal. No dust. No scratches. Your collection will look great. 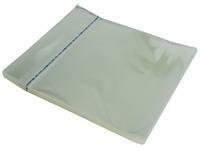 Sleeves are made of clear mylar and are re-sealable. Customer Reviews (3.14 Stars) 7 person(s) rated this product. The previous ones that were polyethylene (?) were much better. 8. Record Sleeves - polylined 12"
9. 5/ 10 Box Bundle 12" x 12" x 1 1/2"